In the Women’s Open, 2008 was as wide open as ever for a Championship to be won. Heading in, the defending Champion LA Aiya was looking like the team to beat, but teams like the Toronto Dragons, Toronto CCYAA, and the SF ArcAngels all had a shot to take it. LA’s big game experience, polished halfcourt game, and depth was unmatched by anyone else. The Dragons’ addition of Niveal Pastrana made up for the loss of NACBA Top 10 player Ann Ching, and the stellar play of pg Angie Leung made this team unpressable. CCYAA suffered through the loss of a top player in Kimberly Lee (defected to the Liberty Division Champion Black Koi), but it may have been a case of addition by subtraction as her departure paved the way for the inclusion of standout twins Elsepeth and Fiona Cheng. The ArcAngels were also in the conversation, as longtime hero Kelly Tiao’s younger sister Tracy Tiao made her first appearance at the Nationals. Following pool play on Saturday, the top seeds were Los Angeles and Toronto CCYAA, followed by the Dragons and the ArcAngels. The possible dark horse of the tournament appeared to be the 2k7 Liberty Champs- the Philadelphia Warriors Suns- who took CCYAA and the ArcAngels right down to the wire in pool play, as PG Megan Griffith was hands down the best player in this year’s NACBAIT. With her peerless skills and unflappable demeanor, Philly’s 3-point attack and pressure defense made them a dangerous opponent. Washington was also a team who may have been able to score the upset, with a core of young players in El Birman, Sunny Chang, and Pui Sham who had the ability to play well above their heads. The NY Lady Cruisers and NY Sabres Blue finished the first day with no wins. In the playoff round, the first game would be the SF ArcAngels (2002 Champs) and the Washington CYC China Dolls (1999 Champs). Washington came out looking like they didn’t know they were supposed to be the underdog, taking it right to Frisco. CYC passed the ball around to set up the shooters, often finding Papa John’s NACBA 3-Pt Shootout Champion Pui Sham (12 pts, 3 treys, 3 assists) for the automatic triple. In the first half, it seemed that the only ArcAngel ready to play was Kelly Tiao (15 pts. 9 rebs, 3 steals) as she was basically doing it all for her team. SF led 23-19 at the half and DC was hanging tough. But a game is 40 minutes, not 20. In the second 20 minutes, the rest of the ArcAngels came to play. Tracy Tiao (7 pts, 8 rebs, 4 TO) and Kathleen Ty (13 pts, 3 assists) played like they wanted it, and SF ended up winning comfortably 51-39. El Birman had 5 assists for CYC. Meanwhile, LA Aiya (2001, 2003, 2004, 2007 Champs) met up with the 0-3 NY Sabres Blue. Los Angeles was struggling with their offensive output the whole tourney, as they couldn’t find their customary rhythm despite finishing with an unblemished record on the first day. Although they weren’t themselves, LA was still able to put the game away 33-23 in a low scoring one. Tiffany Lee and youngster Sabrina Chang each tallied 6 for the Sabres, while Sidney Giang had 7 pts and 3 boards for Aiya. When the Toronto Dragons faced the Phila Warriors Suns, it may have been Philadelphia’s best chance to reach the Final Four. But hometown superstar Megan Griffith had a conflicting family lunch obligation and was unable to make the game at the scheduled time. As such, Angie Leung (9 pts, 2 assists) ruled the backcourt matchup, and Toronto took no prisoners on the boards. Toronto outrebounded Philly 34-16 in a gross mismatch. The score at the half was 37-17 Dragons. In the second half, the Warriors Suns were able to narrow the gap, bringing it down to 8 behind good halves from Shirley Ho (5 pts, 1 steal) and Ling Lai (12 pts, 4 rebounds, 2 treys). In the end, Toronto won 49-39. Lee Anne Chong had 10 for the Dragons. 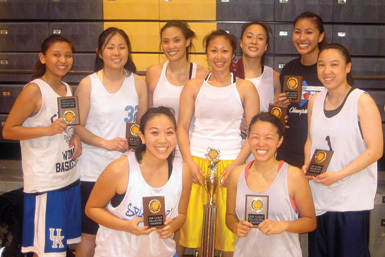 The last Quarterfinal was the game between the undefeated Toronto CCYAA (2006 Champs) and the winless NY Lady Cruisers. Cecilia dropped in 17 points to go along with 2 steals to help cement her standing as a perennial All-NACBA selection. Fiona Cheng added 12 points and 5 boards for CCYAA, while Beatrice Chang had 8 points and 1 trifecta for the Cruisers. The final score was 37-25, Toronto as CCYAA went 11-12 from the line.